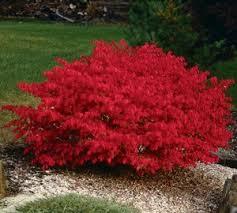 Burning Bush Shrub For Sale - Lowest Prices Online Today! They are amazing and easy to care for when growing! Also adds lots of beautiful red color! Arrived and thrived despite my not opening the box for 5 days. Burning Bush Shrub makes a perfect enhancement shrub for hedgerows or stands as an ideal showpiece with its beautiful color and shape. This shrub belongs to the Euonymus alatus family of bushes, exhibiting splendid color in both summers and later in the fall. The burning bush is one member of the family of fast growing shrubs that turn a vibrantly red in the fall making this an excellent addition to any lawn or garden. The growth rate will allow the privacy to be accomplished at a faster pace while having a vibrant red addition to your fall color. When landscaping your yard, the burning bush will add not only beauty but works as a privacy screen or just an addition to your patio in a pot. This is an easily grown shrub that can be thinned and pruned while still young to keep it under control. The ease of growing makes this the perfect plant for both experienced gardeners and their novice counterparts. For those choosing the Burning Bush Shrub for their landscape needs the planting options are unrivaled by other more limited shrubs. Along the driveway, around the edge of your lawn, or sitting in the center of your garden the burning bush is a welcome addition for everyone. Burning Bush Shrub is one of the most common shrubs in the lawn and garden department, there happens to be an entirely right answer to that, because of its versatility and ease in growing for all desiring beauty. Keep it trimmed down to make a small ornamental piece or let nature take its course allowing the bush to blossom out to full size. Burning Bush Shrub deciduous shrub is full of oval shaped leaves becoming a flaming red color to add fall color to the end of your gardening year. Its foliage will hold a deep color for many weeks in the late fall taking the nearly insignificant yellow flowers into a wildlife treat of berries late in the year. Plant a few of these ornamental shrubs with your other flowering bushes to add a splash of color and versatility to any hedge or set a couple in pots on your patio for the new beauty they possess. Burning bushes may be a standard addition to gardens, but once you have seen the brilliant fall color, you will understand the reasoning behind their choice. Delightful greens throughout the spring and fiery red in the fall make burning bush a stand out among shrubs for all gardeners. A native of Asia, the Burning Bush plant in America has continued to be a popular choice for the bush to plant amongst landscapes in yards since the 1860’s. The lush, dense shrubs easily fill in areas of an aspect where it lacks foliage. For those who prefer full, thick and robust landscapes- this plant is a great addition to have. Frequently displaying green leaves, the leaves turn into a brilliant and stunning red during the fall. This gives the bush the appearance of being virtually on fire. Hence giving this plant, it’s a very descriptive name. Pick these bushes to add perfect splashes of red across a green lawn or landscape. Burning Bush Shrub gives the garden a unique color in the autumn. Burning bush features a greeny-blue foliage in the spring and summer. Once it hit the autumn, you’re in for a treat as it will then show off a fiery red color, giving it its name. With a little bit of creativity in the placement of these bushes within a landscape, they will produce extraordinary visual appeal wherever they are placed when fall arrives.